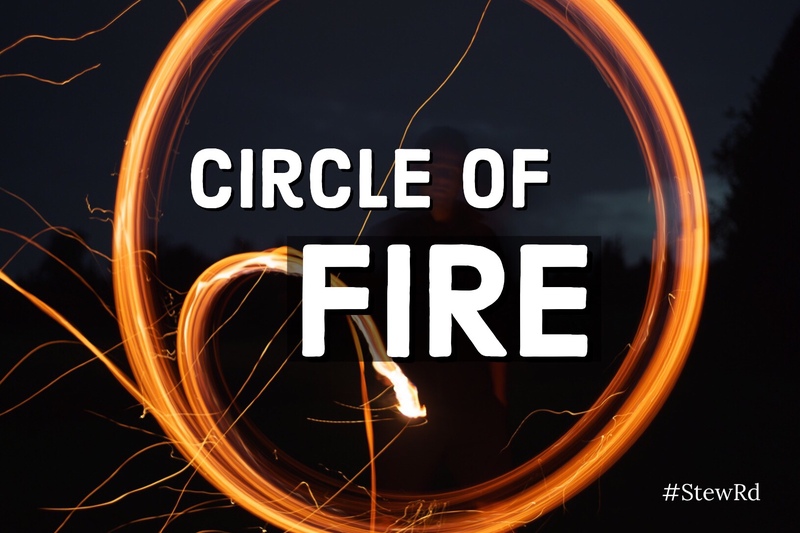 Circle of Fire – Stew Rd. If you had three years to build something that would change the scope of the world, transform billions of people, touch every nation and people group for the rest of natural history and last for all of eternity, could you do it and, if so, how? Jesus did just that. Today we build all types of humanitarian, civic and religious organizations, communities, committees, groups, churches, educational structures, programs and endeavors of all types but Jesus built a circle. He could have chosen any method, but he found twelve (minus Judas that was later replaced) men who became foundational stones, He then set them on fire and it is still glowing, growing and transforming people every day and will continue forever. It was a Circle of Fire. Jesus was the master circle builder! When he formed and fashioned a circle of twelve, there were key components that insured it would have life and power to be sustained forever. If He built a circle that did all of these things, what were those components and how did he do that? Fire – Fire is the first commandment. Love God, want, invite and involve God. Right off the bat, I want to say fire is not hype or a style of ministry. Fire may lead to excitement or boisterous expressions, but some who sustain long term fire inside are not extremely expressive outwardly. Fire is the presence and activity of the eternal, uncreated Spirit of the Living God that takes ordinary people and transforms them into fearless world changers. If you don’t have fire, you may have fellowship and fun but will struggle to bear fruit. It may be His word, His voice, His Presence in prayer or praise but it is the active presence of God in our midst. Only fire can fuel something forever. Fire also purifies and ensures that what you were doing is holy and eternal because anything that stands the test of fire will last forever. John the Baptist said there was one coming after him that would baptize with fire. John Eldridge said if we take everything to community for meeting needs eventually community cannot sustain it. The real fuel and unlimited, eternal strength comes from the fire. Where do we get fire? We get fire by saying ‘yes’ to His offer, inviting and receiving it. Fire is the free gift of the presence and activity of God in our lives. Although it is free, it can be cultivated and fanned from an ember to a flame. Long before he was a ruler, King David cultivated a internal fire in a field with Father God while tending sheep and it never went out. Jesus disappeared to lonely places (Luke 5:16) because he was feeding the fire in secret places with the Father. The presence and power of the Holy Spirit insures we have something supernatural that fuels, consumes and gives warmth and power to those around it. 2. Fellowship – This is the 2nd commandment. If all you have is a fire, eventually it will only be just you at the bonfire. We were built for relationship. When all I have is fire that burns and drives the motor, not only will it eventually be just me that is left, even I will burn out too. We need fellowship. Fellowship is the oil in the motor but it actually helps to fuel fire too. Have you ever tended a campfire? What do you do when the fire gets low? You throw another log on the fire. What happens to the fire when there are fresh logs added? It actually kicks the fire into high gear. Fellowship is friendship. It is fuels our hearts and souls and even practically contributes to mental and emotional health. Jesus loved his disciples. He went to their homes, he ate meals with them, he healed family members, he loved them as the Father loved him. Mark 3:14 says Jesus called his twelve to be with Him and to send them out to preach. There are a number of accounts where the twelve were actively doing things in ministry but for the majority of the time, it looks like they were just being with Jesus doing life together. I wonder if discipleship is supposed to be way more fun than we have made it. Often we think discipleship consists of a classroom and kingdom work. There will be much time of instruction, gritting your teeth and hard work, but real fellowship will include food and fun. In fact, when Jesus gives the 1st and 2nd commandments, the word for “love” God and love our neighbor as ourself is “agapao” which means to love, esteem, show generous concern for and delight in. Delight means to enjoy! Do our circles enjoy people? Is there laughter, hugs and anticipation of being together? If we have fire and fruit but we have no friends (people we love without an agenda other than to love them), we really can’t completely represent authentic love and relationship like Jesus did. 3. Fruit – True fire and fellowship always bear fruit! If fire is the presence of God, and fellowship is relationship with the church, we have a picture of the joining of a husband and wife according to Ephesians 5. In a normal situation, a healthy husband and wife will be fruitful and have children. This is fruit. Fruit is two-fold. It is individual and personal growth and transformation as well as numeric growth of others being added or influenced. In order to have fruit, you have to have something planted. There has to be tending and sending to something new! Fire fuels and fellowship feeds but if there is no fruit you still have not produced anything else outside of yourself. Fruit brings Father glory (John15). It is the proof in the pudding! Fruit requires faith and hard work to plant seeds and tend new plants. Fruit is the harvest, the return on the investment and it nourishes those around it. Fruit also carries the seeds of new life inside that will eventually reproduce and multiply again and again. Fruit is the end result and proves the fullness of real fire and fellowship. 1. Have you ever dreamed of building or creating something that would last forever? 2. Have you ever been a part of a group like Jesus built that contained any or all of those three components? When and where was that? 3. Most of us tend to lean towards one of the three components fire, fellowship or fruit. If there was one you lean towards the most, which one would it be? Why? And. . which would be your least strongest by nature? 4. Do you agree that all three are necessary in order to sustain discipleship? Why or why not? Would you add or take away any ingredients? 5. If you were going to considering building a circle or strengthening the one you are leading, what would be your next step? 6. Have you ever been a part of something really challenging and rewarding that was still a lot of fun? How was it rewarding and what made it enjoyable? 7. Why do you think discipleship can sound intimidating or unpleasant? What would be ways to see that changed? What methods did Jesus use or not use for discipling? Great article by Bob. Very convicting. All too often we focus only on the Fire or the Fruit and ignore the Fun adventure which God wants us to enjoy. I remember several years ago seeing the paintings come out portraying Jesus as laughing. That was a huge paradigm shift. I’d never thought of the Son of God a having fun, LOL. Bob’s article got me to thinking about how often we see Food or Fellowship happening when Jesus is with His Disciples. Could it be that our often omission of food, fun, and Fellowship could be a contributing factor to our evangelical children who leave home and then leave the church? This article was a sobering reminder to rethink what kind of legacy I’m leaving.